I met Mishka Shubaly last year in Denver when I snuck in to town from a gig I was working in Greeley to see Fernando Viciconte and Michael Dean Damron. I hadn’t heard much of his music but Mike spoke highly of him so I checked out his set and was duly impressed. 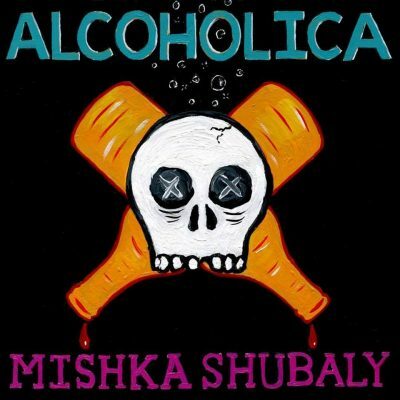 Mishka is one of those artists I’ve always heard about and had in the periphery of my knowledge but I’d never read any of his writing or listened to his music in depth. The sort of artist I’m trying to get around to delving in to these days and as luck would have it Alcoholica came out and reminded me that I had been meaning to give his catalog a thorough going over. Spotify gets the credit for my taking notice as it came up in my Discovery list and off I went. With “We Came Together” playing on the headphones I started down the rabbit hole of Mishka’s work. So I started looking for references on his website, Facebook, and so on. The whole search for the history of this record was futile. I couldn’t find the story anywhere at all. Luckily for us we live in a time where you can send a message to just about anyone so I contacted Mishka through Facebook to see if he’d tell me the story of this record. I don’t know if he remembered me from last year in Denver or not but he did respond and briefly told me the story about why this the lost record. The title, Alcoholica, is a play on “juvenilia” which refers to an artists work when they were or before they were fully formed as an artist and that makes sense since it was recorded in 2001. That year Mishka had a friend pass away, got shipwrecked, and then 9/11 happened so there wasn’t ever a decent time to release a record. With a year like that this record seemed stupid (his words, not mine) and so it got shelved. He went back a couple of years later and wasn’t happy with the arrangements and being that far removed from making the record some it just seemed juvenile. The idea was to make a ambitious record and in the end it sounded a little schizophrenic. Add in the fact that the female vocals are from Allison, Mishka’s “big ex” and you have a record that was just going to gather dust. What drives someone to release an album with all of that baggage? Well, it’s 15 years on and Mishka and Allison are on decent terms, he’s alright with the schizophrenic sound because life’s just like that sometimes, and people wanted to hear it. So what he have a a time capsule opened 15 years later, a look back in to who the artist was and not who he is today. It’s weird to be writing about an album like this as my first real foray in to his music but the way my life’s been going lately it’s also rather aprospos. The swings in the songs seem to fit really well in the roller coaster even if, like Mishka, I’m not in the place that some of these songs take you. I don’t know that everyone will enjoy this record as one you listen to all the way through in a sitting. It is a bit scattered, like the kind of scattered you get when you’ve been for days with chemical assistance. For every amazing song there’s one that seems out of place or is a bit too funny for the vibe but at the same time that’s what life is like. Songs like “Get It On” are like that friend you have that doesn’t read social queues very well and makes inappropriate jokes, they might not fit in as well as the others but they’re endearing all the same. While songs like “My Love is a Gulag” seem like that old t-shirt that’s a little tattered and faded but you keep wearing because of what it means to you. I’m sure you can find a track of three that really speak to you, for me those vary just about every listen! You might not find the same emotional depth as his more recent work or the same maturity in the writing but that’s somewhere we’ve all been in our lives and I know it’s something I can relate to. In the end this really is a window to the past and while I enjoyed the record before knowing the story, listening to it with that in mind, and thinking back to where I was 15 years ago, or better yet 21 years ago at the same age, makes this record all the more meaningful. In the end this is a record I would have directly related to had I heard it in 2001 but hearing it now, as a new release, I relate to it in a much different way. We all have our past and I think that everyone that reads this site appreciates artists who bare their souls. I don’t know that you can get more visceral than releasing an album recorded a decade and a half ago after having moved on from just about everything that formed the base of your art during that period! I, for one, appreciate this look in the Mishka’s past and the start of my delving in to his art, both the music and his writing. I hope that some of you can find the beauty that I find in this sort of record and its story. 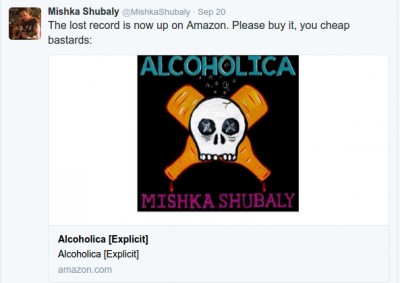 You can find Mishka on Facebook, Twitter, Instagram, or his official website. You can pick up Alcoholica at Amazon.